All foreign flights to and from the Iraqi Kurdish regional capital Arbil will be suspended from this evening on Baghdad’s orders, following a controversial independence referendum. 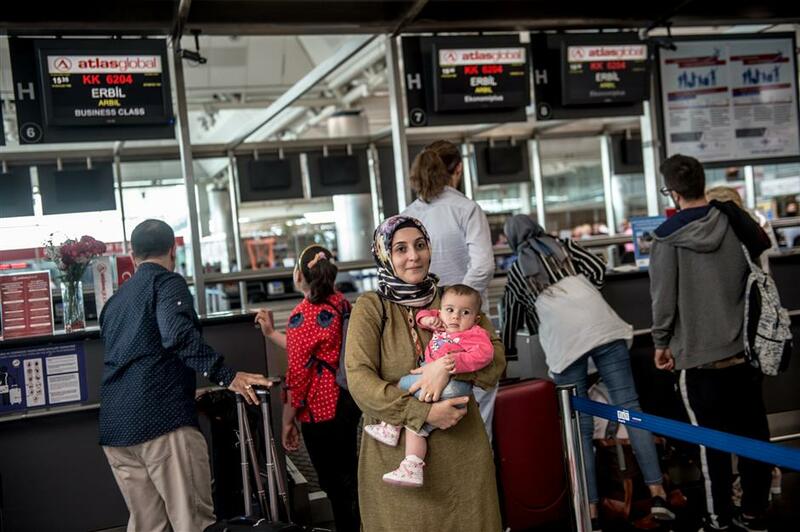 Passengers flying to Arbil wait to check-in for their flight at Ataturk International airport in Istanbul on September 28, 2017. All foreign flights to and from the Iraqi Kurdish regional capital Arbil will be suspended from this evening on Baghdad’s orders, its airport director said, following a controversial independence referendum. “All international flights without exception to and from Arbil will stop from 6pm (1500 GMT) on Friday following a decision by the Iraqi cabinet and Prime Minister Haider al-Abadi,” Talar Faiq Salih said Thursday. Abadi ordered the halt to flights serving airports in Iraqi Kurdistan in retaliation for the independence referendum held on Monday in defiance of Baghdad which delivered a resounding 92.73 “yes” vote. A large number of foreigners working in Arbil were leaving the city Thursday for fear of being stranded with only a visa issued by the Kurdish authorities and not recognized by Baghdad. Regional carriers, including Turkish Airlines, EgyptAir and Lebanon’s Middle East Airlines had already announced that they would be suspending their flights serving Iraqi Kurdistan at Baghdad’s request. The Arbil airport director said she deeply regretted the decision, which she said would hamper the campaign against the Islamic State group in Iraq and neighboring Syria, as well as the delivery of aid to those displaced by it. “We have consulates, international staff, international companies, so it’s going to affect everyone. It’s not a right decision,” Salih said. “We have a big international community here, so this is not only against Kurdish people.